Take the time to teach a child. 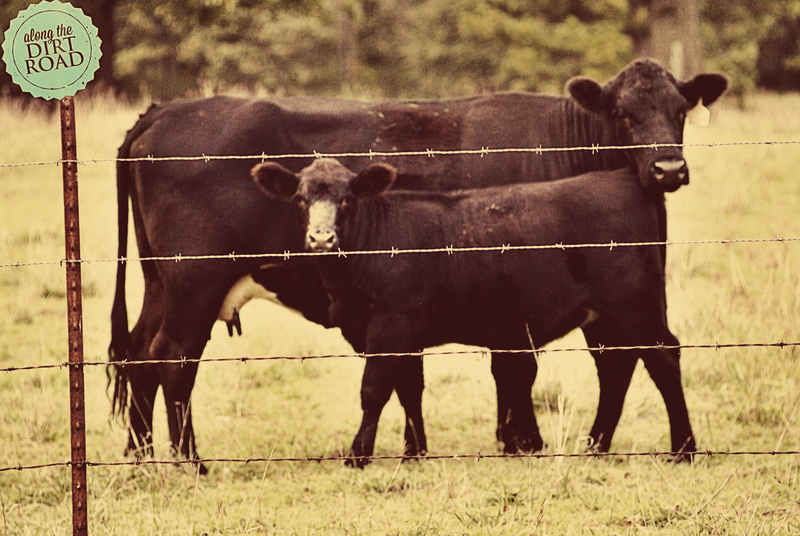 Black Angus cattle have a special place in my heart. 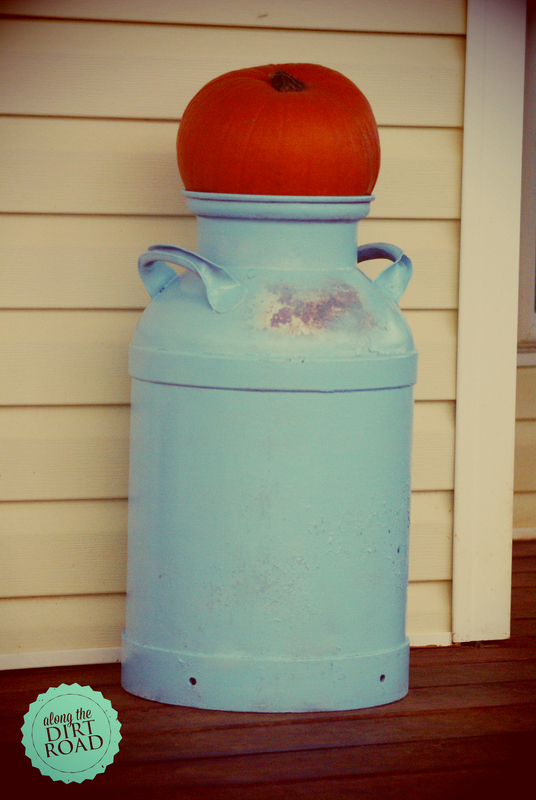 My sweet grandparents had a little farm and that was their livestock of choice… as will be ours someday, I am sure. Granddad’s gentle way with his cows amazed me. He probably didn’t realize it, but it taught me a great respect for the creatures that God has blessed us with. Especially the ones that aren’t just pets but actually help us, during our few turns on this earth. I think that the momma cow in this picture is content with her calf. I think that in the grand scheme of things, this is exactly how it should be. I think that our relationships with others mold us, eternally. I’m so thankful for my heritage. I am thankful that someone, very lovingly, took the time to teach me the love for the land and the things that live on it. Happy Thursday, Dirt Roaders! Don’t forget to treasure. A momma and her baby. Simplicity is for me. 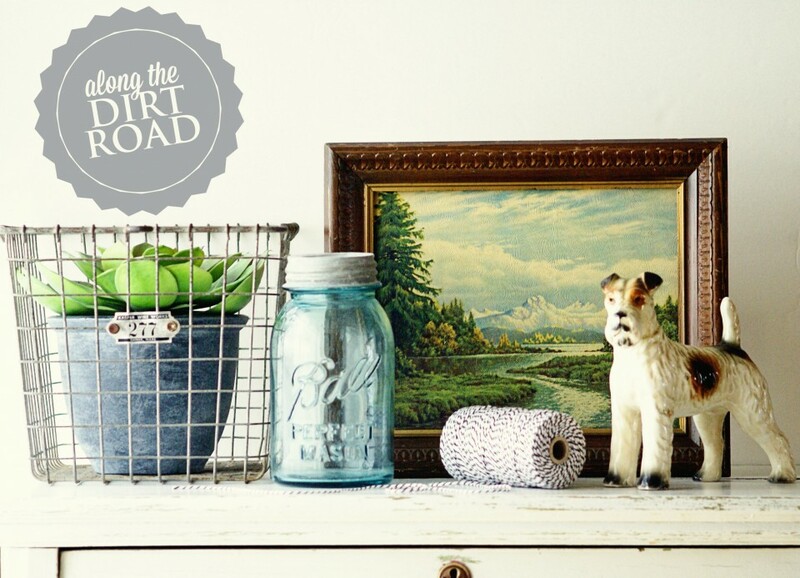 Happy Wednesday, Dirt Roaders! Some years just call for a little change. Those were my thoughts regarding the cream can. It was a faded red. Then I dry brushed over that with white. (Insert gagging sounds.) Something about that, I just didn’t like, which is quite surprising. I love “well-loved” white things. Not this time. So…a trip to Wal-Mart was in order. Today was a day…for major change. I love it. It makes me as happy as a cream can…well…can. (I am smirking…thinking about the people who are rolling their eyes.) I hope that you like it as much as I do. Anywho…just wanted to share with you one of my favorite things today. This bowl was a gift from a friend, once upon a time. I love it. 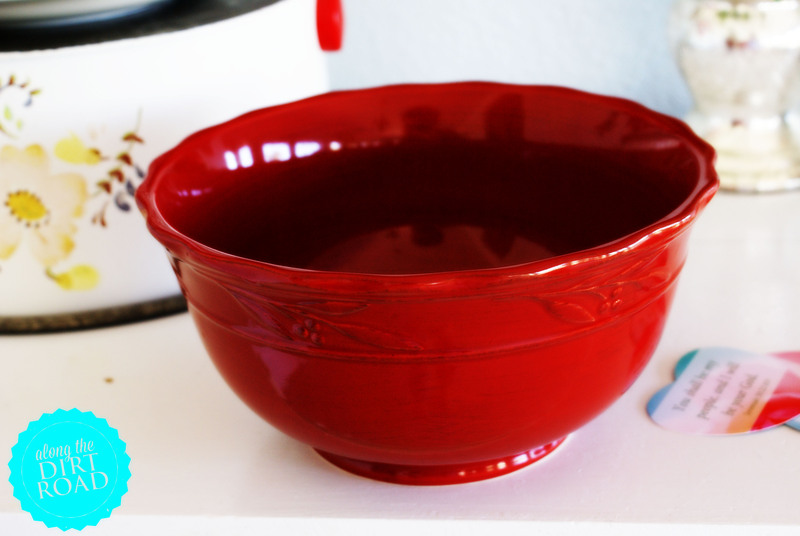 Actually there are many bowls that I love. They are addicting. Thank you Mother. You passed on your obsession. The first thing that she and I do, at a sale, is pick up the bowl and do the flip to see what it says on the bottom. Hey…it’s a junker life skill. A bowl from my Jenny friend. Hey…it’s Friday. A little corniness is allowed, right? (I’m referring to the title of this post.) Of course it is! Three cheers for Friday, you say? Go right ahead…I will wait. Dum…dee…dum…dum..dee..dee..dum. Are you finished? Okie doke. Here we go. So about the twigs. Have you seen them? Last year when they came to my attention, I loved them. I thought that they would look so sparkly and cozy and homey. Then I got some. They still looked…well…all of the above…but I just couldn’t get them to feel like “me.” Does that make sense? Okay…thanks. For one thing, they were super tall. Another thing…they were straight as a stick. Hardy-har-har. 😉 Really though, they were just straight and sticking up…and had no character. 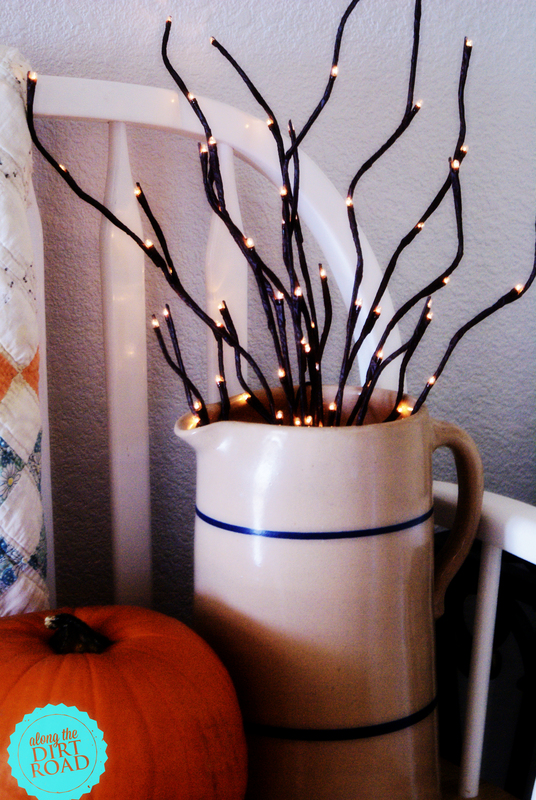 Now…you may have lighted twigs that are 6 feet tall and love them. I think that is great. I just couldn’t fit them in where they felt “right” around here. (Mine weren’t 6 feet tall.) Now I am in love with my little, curvy, cozy twigs. They make me smile. Happy Friday, Dirt Roaders! Now…dig something out of somewhere and work it over! Welcome to our ~((()))~ Home. Have you ever looked in a magazine or maybe at a blog where they have an enormous foyer? (Foy-yay…. ;)) I have seen them that are so huge that they have room to put a (very tall) Christmas tree or a round pedestal table with a GINORMOUS floral arrangement. I LUFF that! It looks so elegant. I think that even if your home isn’t built with a certain offset place at the entry…there are things that you can do to create one. You guys know this. I am telling you absolutely NOTHING….you’ve got this! A table, lamp, mirror, coat rack and cozy pretties. 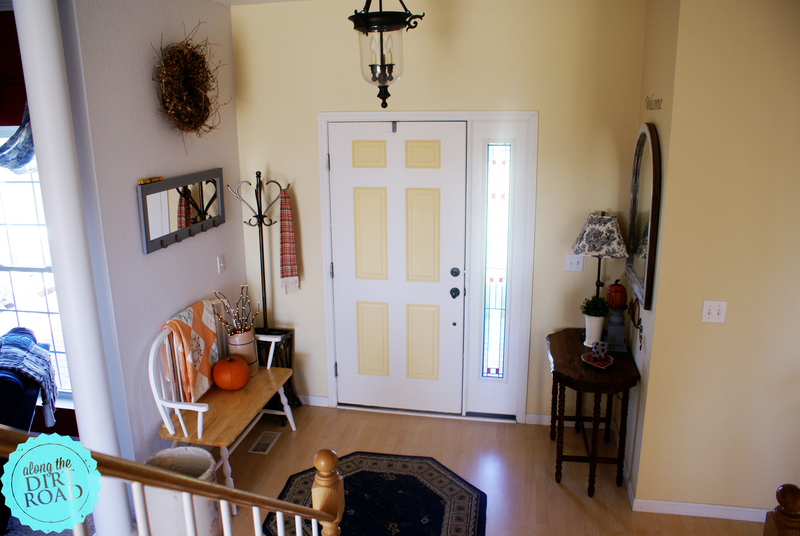 There is just something about these things that help our homes welcome others when they walk through the door. Happy Thursday, (ahhh…you are finally here Thursday ;)) Dirt Roaders! 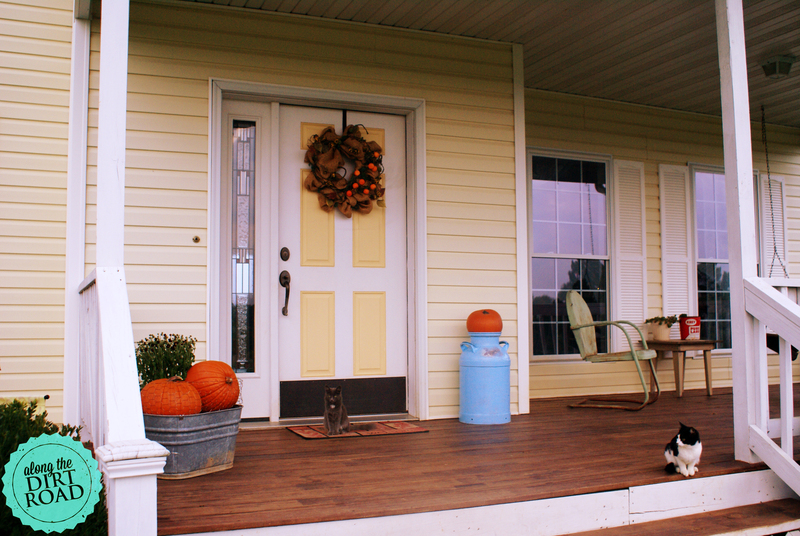 Now…go forth and decorate those entryways! Mr. Henry thinks that his real name is Don Juan. 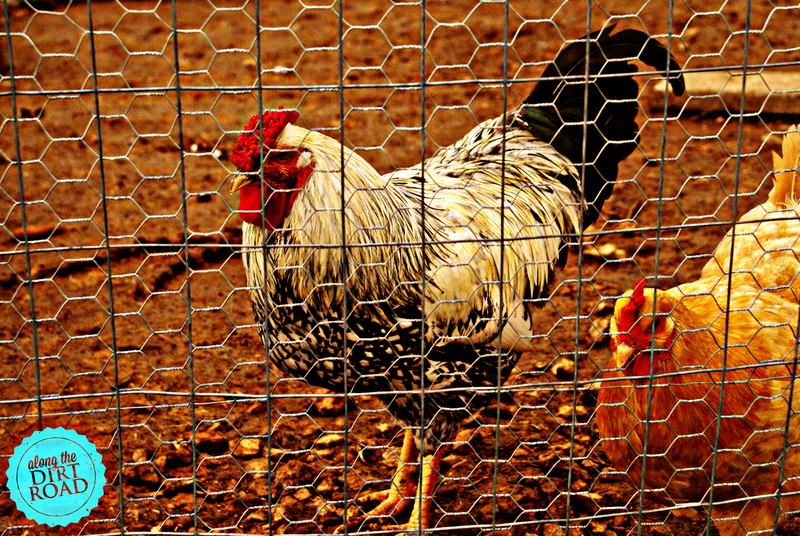 He used to share his coop with five other roosters and back then he wasn’t very sure of his place in this ol’ world. Now…he is all alone with his ladies. He has much to crow about. He has his own little kingdom out there in his fancy-schmancy coop that my hubby and his dad built. I would say that Mr. Henry is doing all right in this crazy world. He has someone who takes care of him…and a life to enjoy. Hmmmmm…..sounds like us. God takes care of us…and gives us a life to enjoy. Are we grasping that? I hope so. Mr. Henry and one of his wives. 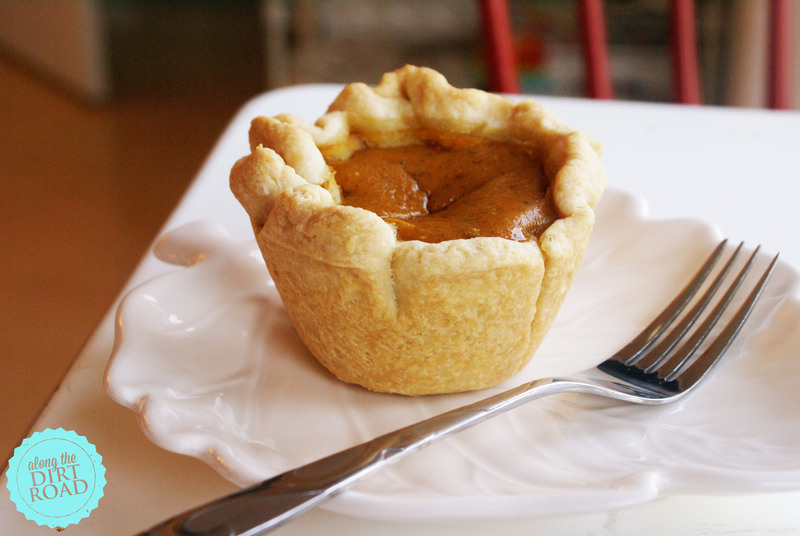 Is it too early for pumpkin pie? So, we used the same recipe. We just made individual pies instead of one pie. They were so pretty. So classy. At least they were…until we covered them in squirty whipped cream. My family likes to do that. They are not concerned with their food looking elegant. They are not ashamed to cover things in dressing, whipped cream or squirty cheese at any given time. Because they are my family…and I love them…if it makes them happy…I am happy. Happy Tuesday, Dirt Roaders. Bake some pie! 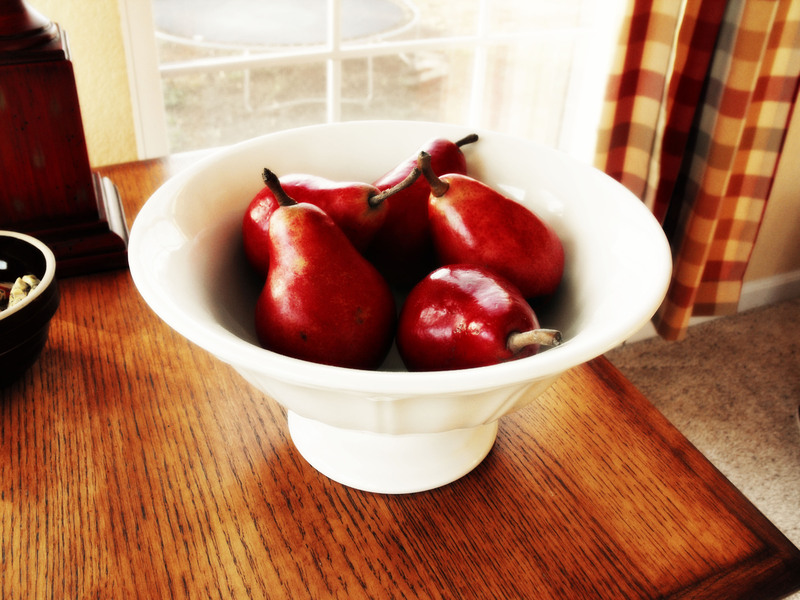 No partidge yet…just the pears. We have had cozy weather over the weekend. Maybe…just maybe fall is on the way. 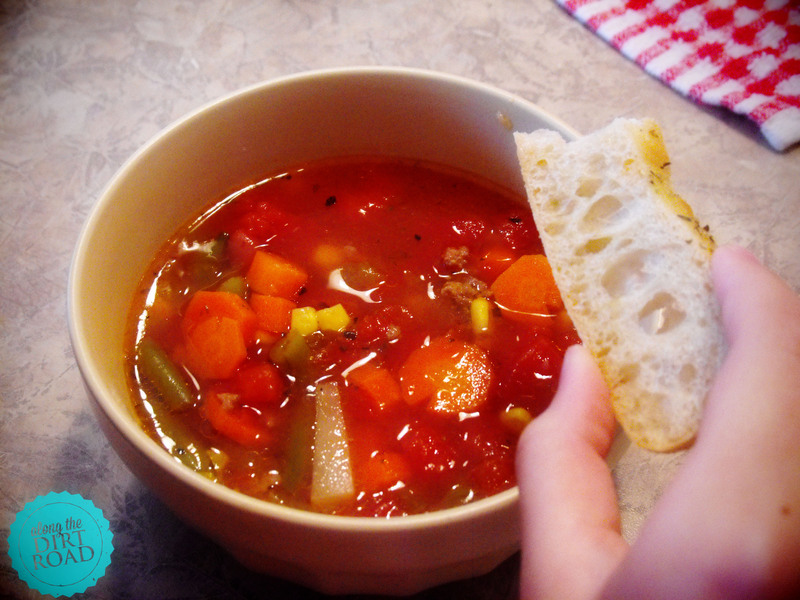 Is it a soupy day where you live? It is rainy here. I love rainy days. They are so cozy. They also call for giant vats of soup, especially this close to fall. I think that I shall go with a Veggie Beef Soup today. It’s pretty basic. Maybe some Loaded Cornbread. Yum! Have a happy, relaxing, Saturday, Dirt Roaders! Enjoy the sound of that rain. zzzzzzzzzzzzzzzzzzzzzzzzzzzzzzzzzzzzzzzzzzzzzzzzzzzzzzzzzzzzzzzzzzzzzzzzzzzzz!